With reports suggesting ten minute delays in surgery can add up to $130,000 a year, it’s little wonder there’s momentum behind moves towards single use procedure packs. DePuy Synthes is targeting one of the more commonly performed orthopaedic procedures with its new offering. Among the most common fracture types, those of the wrist account for up to 18 percent in the elderly. With demand rising for surgical procedures such as this, surgeons and providers want a solution that enables high-quality treatment for patients while improving efficiency, reducing costs and minimizing delays associated with instrumentation and sterilization. 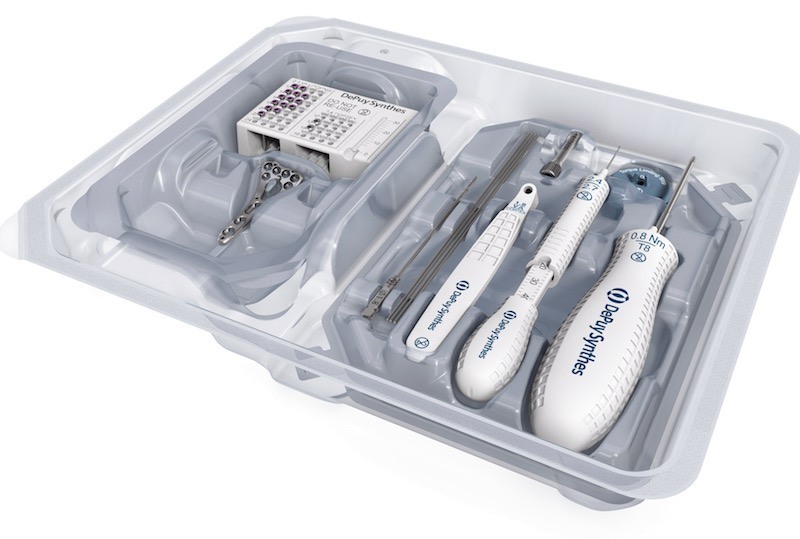 J&J’s DePuy Synthes has introduced the Distal Radius Sterile Kit, a presterilized, single use kit of instruments and implants to treat wrist fractures. The goal is to eliminate more than 60 percent of steps associated with processing reusable sets while delivering the company’s market-leading plate and screw implants together with presterilized, single use instrumentation. Despite the unavoidably simplified composition of the kit it will still deliver what is needed for up to 80 percent of distal radius fracture cases currently treated with plates and screws. It consists of one Variable Angle LCP Two-Column Volar Distal Radius Plate, a distribution of screws, and the required instrumentation. In support of its new initiative, DePuy Synthes points to an industry report citing that single use kits may save approximately $285 per procedure for sterilization, transport, and handling. The launch announcement was made during the combined congress of the Federation of European Societies for Surgery of the Hand and European Federation of Societies. Previous Previous post: Can Antibacterial Agent in Sutures Reduce SSIs?